The telling of Aboriginal history in Canada often begins with a discussion of human migration routes into the Americas, which reflects the long-standing misperception that was held by Europeans that Aboriginal societies were primitive, usually migratory, and unlikely to have been in the Americas for very long before the 15th century. This misperception, of course, served European empires in the Americas very well because it justified the dispossession of native peoples from their lands. Human occupation of the Americas is itself a complicated tale. However, there is general agreement among scholars that modern hominids were hereabouts some 12,000 to 14,000 years before the Present Era (BPE). Another is before the Present Era (BPE), which arose from the use of radiocarbon dating and uses January 1, 1950, as its baseline. Therefore, 10,000 years BPE equals 10,000 years before New Year’s Day, 1950. Recently the Common Era (CE) and before the Common Era (BCE) have become more widely used. These two terms align exactly with the Christian system, dividing time approximately 2,000 years ago. Some Christians object to the BCE/CE system as an attempt to secularize the use of BC and AD; some non-Christians retort that BCE/CE is just the Western and Christian system in disguise, imposing itself on other cultures for further generations. This debate makes it clear that dating is neither scientific nor especially logical — it is cultural. It is perhaps worth mentioning that the most precise calendrical system in the Western Hemisphere originated with the Zapotec and Olmec societies and was subsequently refined by the Mayan culture. It consists in part of a long count that begins on August 11, 3114, BCE. For convenience, BPE is used in this text when referring to events occurring more than 4,000 years ago; it is most commonly used by archaeologists in conjunction with radiocarbon dating — a means of determining the age of organic materials by measuring the amount of radioactive decay of carbon-14 in the material. Otherwise, BCE and CE are used as they are most likely to correlate with what you will read elsewhere. Scientists and archaeologists hold several theories regarding the origins of Aboriginal peoples in the Americas. By far the oldest and most widely accepted of these theories is the Bering land bridge migration model. This theory posits that during the last ice age (approximately 50,000-10,000 BPE), humans were able to migrate from Siberia to Alaska over land. Evidence suggests strongly that for as many as 100,000 years, sea levels were much lower than they currently are and the Bering Strait — the body of water that separates Siberia from Alaska — was an open plain of land and glaciers (which scholars call Beringia). 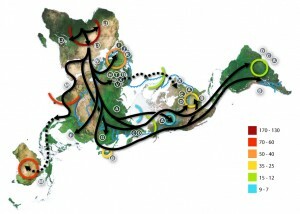 During a period of several millennia, about 10,000-14,000 BPE, as many as four distinct migrations are thought to have occurred over the land bridge. People migrated from Siberia, Eurasia, and coastal Asia, following the megafauna of the Pleistocene (to about 12,000-11,000 BPE). The greatest supporting evidence of the Bering land bridge theory is the extensive homogeneity of the North American Clovis culture, so named for the archaeological site in New Mexico where it was first identified. The Clovis people were long considered to be the first to inhabit the Americas. Archaeologists theorize that the Clovis came over the land bridge and down a glacier pass to the east of the Rocky Mountains sometime between 12,000 and 11,000 BCE, eventually spreading through much of North America and into South America. Everywhere they went, Clovis people littered their camps and settlements with stone tools and weapons that bear some trademark features and suggest close cultural links. A second theory focuses on Pacific sea travel. The coastal migration theory suggests that some people arrived in the Americas by following the coast of Asia and Beringia, down the western shore of North America, all the way to South America. The coastal migration theory is bolstered by the fact that the rich marine environment would have supported maritime people well. Travel by boat would also be much faster and easier than the route overland, thus allowing people to spread throughout the Americas much more quickly. The most compelling evidence supporting this model comes from archaeological sites in South America that predate the North American Clovis sites. Sites like Monte Verde in Chile date to 14,800-12,500 BCE; Taima-Taima in western Venezuela dates to 13,000 BCE. These two sites contradict the notion of “Clovis first.” However, there are far fewer archaeological sites that support the coastal migration theory compared to the Clovis sites; there may be more but, due to rising sea levels in the intervening millennia, the coastline of the Pleistocene era now lies under the Pacific Ocean. Barring breakthroughs in submarine archaeology, further evidence of earlier coastal migration at the source is lost to us. Although the two theories might seem to be at odds with each other, most historians and archaeologists now accept that both are probably correct, and that human migration to the Americas occurred over a very long span of time, over land and by sea. It is, however, important to note that conclusive evidence in support of either theory continues to elude us; these are still hypotheses only. There is currently no conclusive archeological proof of human existence in the Americas before about 20,000 years ago, but the DNA evidence points to a considerably earlier period of settlement. There is no genetic indication of migration from Europe or Africa, so the suggestion (which has been around since the late 15th century) that the Aboriginal peoples must have some roots on the other side of the Atlantic is utterly unproven. This point is important because for hundreds of years after the arrival of Europeans, efforts were made to explain the presence of Aboriginal people as the “Lost Tribes of Israel,” wayward Welshmen, or some other European offshoot. DNA studies have exploded this thesis: not one study has shown conclusive proof of European genetic markers among the Native American population before 1492. Figure 2.6 World map of human migrations based on studies of mitochondrial (matrilinear) DNA. Dashed lines are hypothetical migrations. Numbers represent thousand years before present (BPE). The blue line represents area covered in ice or tundra during the last great ice age. The letters are the mitochondrial DNA haplogroups (pure motherly lineages); haplogroups can be used to define genetic populations and are often geographically oriented. Indigenous people throughout the Western Hemisphere talk of their origins in oral histories, stories, and myths that link them intimately to the places they inhabit. The land, the stories commonly assert, was made for “the people,” and they were made to inhabit the land. Every group has an origin story, and they vary widely while having elements of consistency. Sometimes, groups have multiple origin stories that tell differing versions of creation and the founding of the group. Origin stories often begin with a “First Person” (or First Peoples), a mythical man or woman who founded the group. These First People often are created from, or emerge from, the natural world itself. For example, the first Iroquois and Wendat/Huron fell from the sky. An elderly couple of great virtue survive various trials to give birth to the peoples of the Earth, according to the Mi’kmaq. Animals play important roles in these stories as well. In the creation story of the Haida, Raven arranges things nicely and then releases the first humans from a clamshell; the Cree tell of the Earth mother’s offspring/agent Wisakedjak (a shape-changing and benign trickster whose name is widely mispronounced as “Whiskey-Jack”) who peoples the world. And there are stories that involve a singular creator, such as the Blackfoot figure Napi, who moulds the world and everything in it from a lump of mud. The oral traditions of the Lenape/Delaware and Iroquoian peoples, along with records from the Anishinaabe Midewiwin scrolls, refer to “Turtle Island,” a useful convergence of origin tales that has acquired broad acceptance among Aboriginal peoples since the 1970s. These origin stories encapsulated and shaped the worldview of each group, establishing their people’s purpose in this world as well as their relationship to the spirits and the world around them. In other words, origin stories are key to establishing a group identity and a deep connection with the region the people inhabit. It is also the case that these stories are invoked by Aboriginal peoples as sufficient to their needs as regards history. Whether ancient peoples crossed Beringia or paddled in proto-kayaks along the west coast is perhaps interesting but no more proven and demonstrable than an allegory of cultural birth on an island of mud. The time between the arrival of humans in the Americas until 10000-9000 years BPE is known as the Paleo-Indian period. During this time, humans spread throughout the Western Hemisphere, supporting themselves with similar subsistence patterns and technologies. Paleo-Indians were nomadic hunter-gatherers. They moved as frequently as once or twice a week, hunting the big game of the Paleolithic: the megafauna. These included now-extinct creatures such as the mammoth, mastodon, short-faced bear, enormous versions of the modern-day sloth, the very muscular dire wolf, and upsized editions of moose and beaver. Paleo-Indian technology included knapped, or chipped, stone tools such as scrapers, knives, and projectile points, such as the Clovis point. These were made from a variety of materials including bone and antler, obsidian, quartz, chert, and flint. Throughout the Paleo-Indian era, the spear was the most common weapon. At first, humans used spears as thrusting weapons, which required very close engagement between the hunter and game, a dangerous prospect when dealing with giant prey and predators. Sometime during the Paleo-Indian era, humans developed new kinds of technology, including a lighter throwing spear and an implement to propel this spear much farther: the atlatl. The atlatl, or spear thrower, was one of the most important items in the late Paleo-Indian tool kit. It was a long, thin piece of wood with a notch at the end. This notch was designed to receive the end of a spear or dart. The atlatl acted as an extension of the throwing arm, enabling the spear thrower to greatly increase the velocity and range of the cast. Paleo-Indians probably lived in groups that anthropologists call bands, small groups of related individuals, typically no bigger than 100 to 150 people. This setup allowed for a simple leadership structure, probably with one individual at the head of the group. It also allowed for easy mobility, and hunter-gatherers such as Paleo-Indians lived with only transportable and reproducible possessions. One of the greatest problems of living in such a small group, however, was finding a suitable mate. Anthropologists think that regional Paleo-Indian bands came together yearly in the summer months to celebrate religious rituals, pass along news, and exchange young women and men to ensure genetic diversity among their groups. From 10000 to 9000 BPE, Earth’s climate began to warm, and the North American environment changed. A warming world created opportunities for plants to thrive and diversify; it also created large bodies of water as glaciers and ice caps melted. Over the next 6,000 to 7,000 years, native cultures developed and diversified during the Archaic and the Woodland periods, 10000-3000 BPE and 3000-1000 BPE respectively. Paleo-Indians adapted to the world around them, learning to rely more on a diet rich in plant materials. For reasons as yet unknown, megafauna began to die out, and Aboriginal people had to rely more on bison and other relatively smaller game animals for meat. It was near the start of this period, around 9000 to 7000 BPE, that West Coast societies started organizing themselves around salmon fishing. The Nuu-chah-nulth of Vancouver Island, for example, began whaling with advanced long spears. The Maritime Archaic is another expression of North America’s Archaic culture of sea-mammal hunters in the subarctic. They prospered from approximately 7000 BCE to 1500 BCE (9,000-3,500 years ago) along the Atlantic coast of North America. Their settlements included longhouses and boat-topped temporary or seasonal houses. They engaged in long-distance trade, using as currency white chert, a rock quarried from northern Labrador to Maine. It was, as well, during the Archaic and Woodland periods that the peoples of the Americas also began to domesticate plants, leading to one of the most important transformations in human history: the development of agriculture. The Archaic agricultural revolution got underway in Mesoamerica (the area between Central Mexico and Costa Rica) and in coastal Peru by the Caral-Supe (also called Norte Chico) civilization. In Oaxaca, Mexico, people tended squash vines in order to use the hard fruit as containers. Eventually, more tender forms of squash became a food source. Following the domestication of beans, around 6000 BPE, Mesoamerican peoples became more sedentary. Finally, maize (or corn) was domesticated sometime around 5500 BPE. 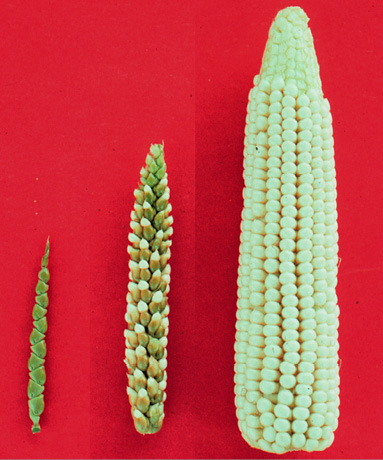 Over thousands of years, the tiny teosinte seed pod, measuring about four centimetres long, was transformed though cultivation into much larger, nutritionally rich ears of corn. The domestication of maize completed the Mesoamerican triad: corn, beans, and squash. The “three sisters” provided an ideal diet. Aboriginal agriculturalists all over the hemisphere grew these crops as their principal foods until many years after European contact. This combination of plants proved ideal as they supported one another in growth. The corn grew tall and provided a “pole” for the beans to grow up and around, and the large squash leaves provided shade that retained moisture and inhibited the growth of weeds. As well, beans, which are “nitrogen fixers,” returned nitrogen back into the soil that the corn crops stripped out during growth. It was a diet that served the Mayan civilization exceedingly well. Agricultural societies, where they are successful, witness significant population growth and a degree of urbanization. The farming societies of Mesoamerica produced some of the largest and most elaborate city states in the Americas, comparable to European, African, and Asian civilizations in many respects. Architectural styles were elaborate, city layouts were complex and aesthetically stunning, and artistic and scientific knowledge was peerless, especially in the field of astronomy. Further, from about 200 to 900 CE the Mayan civilization crested on the strength of an infrastructure of priesthoods that was the underpinning of the whole culture. Although the Mayan Empire declined sharply in the eighth and ninth centuries CE, the Aztec Triple Alliance followed with another, more militarized, iteration of Mesoamerican power from the 1300s to the 1500s. The Aztec capital of Tenochtitlan was, in the late 1400s, one of the largest cities on the planet and possibly the most beautiful, a fact that tells us a great deal about the administrative, creative, technological, and cultural sophistication of these pre-contact civilizations. Agricultural knowledge and techniques spread from Mesoamerica throughout the temperate parts of the Western Hemisphere in a process called diffusion. Although corn and beans probably came from Mesoamerica, other peoples throughout North America contributed to the body of agricultural knowledge and accomplishment across the continent. Less successful was the domestication of animals. There weren’t a lot of suitable species available for experiments in domesticated rearing, although turkeys and dogs were notable exceptions. Horses, which may have originated in the Americas, disappeared along with the megafauna some 8,000 years ago. Mountain goats and bighorn sheep are fiercely recalcitrant creatures and almost impossible to contain, let alone domesticate. There was no equivalent of the African cattle to turn into a placid source of milk, meat, and hides. Most significantly, perhaps, there were no pigs or even boars to pen up and dine on. The ramifications of having few domestic animals was significant to the history of Aboriginal peoples. The absence of large draught animals meant that land had to be cleared and prepared by human energy alone. Soil exhaustion could be postponed to some degree by composting or using fallow field practices, but Aboriginal farmers lacked access to the sort of fertilizers that cattle- and chicken-rearing peoples could exploit. Turkeys, which were domesticated, have the advantage of size and ease of capture, but they do not produce as many eggs and thus offspring as prodigiously as chickens. The inability to secure a household source of protein meant that Aboriginal diets necessarily relied more heavily on wild game and fish than was the case in much of Europe, Asia, and Africa. This resulted in a more nomadic or semi-nomadic life for many societies, and that constraint worked against large-scale and concentrated populations. Even the farming communities were obliged to augment their agrarian economy with wild meat and fish, which is much more time-consuming than slaughtering hogs. Further, the lack of dairy animals precluded women from weaning their infants onto cow, goat, or sheep milk, which meant that Aboriginal infants were breastfed longer, which in turn limited population fertility. Finally, the absence of domesticated animals meant that Aboriginal peoples were not exposed to cross-species infections and epidemics. For 10,000 years or so this proved to be beneficial, but after 1492 it was disastrous, the reasons for which are explored in Chapter 5. Two theories currently explain the arrival of humans in the Americas: the Bering Strait land bridge theory and the coastal migration theory. The timing of early human occupation of the Americas is uncertain and archaeological evidence keeps pushing back the arrival dates. Aboriginal peoples’ traditions point to occupation of “Turtle Island” since time immemorial. Agricultural societies appeared about 6000 BPE and complex communities arose throughout Mesoamerica, spreading into the interior of North America. Bering Land Bridge by National Oceanic and Atmospheric Administration is in the public domain. Map-of-human-migrations by 84User is used under a CC-BY-SA 3.0 license. Maize-teosinte by Gauravm1312 is used under a CC-BY 3.0 license. 2.3 The Aboriginal Americas by John Douglas Belshaw is licensed under a Creative Commons Attribution-NonCommercial-ShareAlike 4.0 International License, except where otherwise noted.